If your agency is responsible for increasing your customers’ conversion rates, you’ve likely explored – and are utilizing – a variety of CRO (Conversion Rate Optimization) strategies to meet the business objectives of your customers. Whether the goal is to get more newsletter signups, or boost ecommerce sales, using offers as a CRO strategy is one of the fastest and easiest ways to increase conversions. The beauty of using offers, and specifically Picreel’s CRO platform, is that our customizable overlays can be made to work for any type of industry or business. Offers can work for a local home cleaning service company by providing new customers with a discount, and they can be equally effective for an enterprise SaaS company pushing to schedule more software demos. There is no one-size-fits all approach; in fact, the most successful (highest converting) overlays are customized for your customer’s business to deliver truly valuable and relevant offers. They’re highly-targeted to be shown at the right time, in the right place, to the right person. While this might sound complicated, Picreel makes it incredibly simple to create a campaign that looks and acts like an extension of your customer’s website. Our Agency Plans are complete turnkey solutions, and with a dedicated CRO specialist on your side, you can start creating campaigns for your customers and seeing CRO results today. What’s more, we created Picreel with real people – not IT experts – in mind. Our intuitive platform and easy editor means that anyone at your agency can confidently create, implement, test, and analyze offer campaigns – even if they have zero experience. We’ve gone a step further to make it a snap for agencies to manage all their customers’ campaigns from a single dashboard, allowing you to toggle between accounts, get real-time statistics, and make changes to any of your customers’ offers with the click of a button. Best of all, you have absolutely nothing to lose except more conversions. Picreel guarantees a 25% boost in conversion rates, and gives agencies priority support to make sure the campaigns you create are built for success. If you’re interested in using offers as a CRO strategy for your agency’s customers, we’ve put together a step-by-step guide loaded with tips and best practices to get you started. Your customers have hired you for CRO because their websites aren’t performing as they should. Site visitors are leaving before they take some desired action: signing up for a mailing list, scheduling a demo, requesting a quote, or purchasing a product or service. In the past, the answer might have been to drive more traffic to the site. For example, if 2% of traffic was converting, then increasing traffic from 10,000 to 20,000 per month would effectively double conversions. While this is true, it requires far more time, money and resources to acquire new traffic than it does to leverage existing visitors. Getting people to a website is the hard part. Being the solution they were looking for is how conversions are won. But this requires understanding your customer’s audience, and looking at a website from their perspective. A CRO audit is the first step to evaluating your customer’s website to analyze existing traffic, activity on the site, and the effectiveness of existing assets (content, blogs, downloads, interactive elements like videos, calculators, etc). The audit will identify opportunities where you can leverage the information you found to implement CRO strategies, including overlay campaigns, to increase conversions. This is where we’ll really dive into using offers as a CRO strategy. Also called popups, banners, ads or overlays, the idea is that businesses show website visitors some type of box that contains an offer, usually in exchange for contact information, that drives visitors to take a desired action — i.e. convert. Why Do Some Offers Succeed Where Others Fail? But here’s the thing: ads don’t have to be annoying, intrusive, or disruptive. When properly timed, and when they bring value to visitors, good offers are actually quite welcome (and effective!). That same HubSpot research found that 83% of survey respondents agreed that, “Not all ads are bad. But I want to filter out the really obnoxious ones.” So it’s not that people hate ads in general, they just hate the BAD ones. Understand the customer and their needs – target ads for a personalized experience. Check out these examples of offers that didn’t quite nail it, and what they could be doing better. This is another factor when it comes to the success or failure of overlay campaigns. We discussed exit intent versus visitor engagement extensively in the past, and provided specific examples of when to use exit offers. In short, Picreel’s targeting options allows you to show offers as a visitor makes to leave a website using advanced mouse-tracking technology; or, it allows you to show offers based on time on page, on scroll, or when a link or element is clicked. There is a time and place for each strategy, and both can be successful when used correctly. Here’s a refresher on some specific scenarios when using offers on exit is a better choice. Now let’s take a closer look at some times when targeting offers based on visitors engagement (behavior/activity/interest) is a better choice. Now it’s time to get into the actual campaign development. While there is a lot to think about when using offers as a CRO strategy for your customers, Picreel walks you through each step and makes the entire process a breeze. 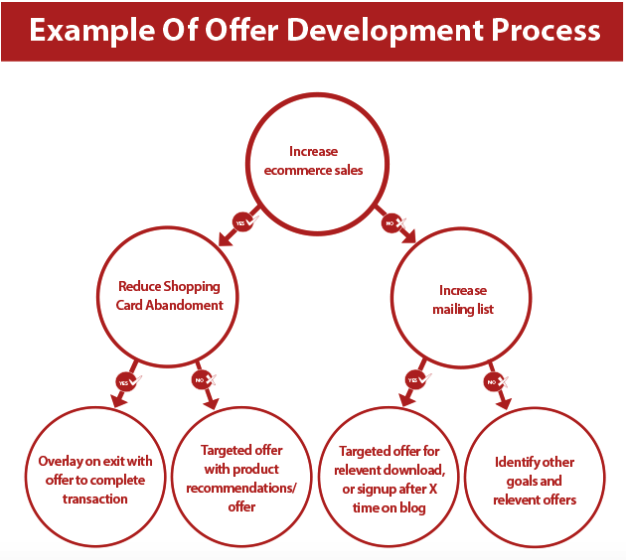 Let’s take a look at some best practices for building your customers’ offer campaigns. This is one of the trickiest parts of building an overlay campaign. What offer will get people to convert? Unfortunately there’s no straightforward, one-size-fits-all answer. It’s going to be different for every customer, and every campaign. This is where working with your Picreel CRO specialist to audit your customer’s website will be helpful, as it will provide insight into their target audience, traffic, and content, and will identify precise opportunities for implementing offers that will prove both relevant and valuable to site visitors. Picreel includes 40+ built-in templates with sample color palettes and wording to get you started. While you can use the templates as-is, they are easily customized with hex color codes, custom fonts, images and GIFs to give offers the same look and feel of your customer’s website. This is also where you’ll choose the overlay position, animation, and whether to add social buttons. 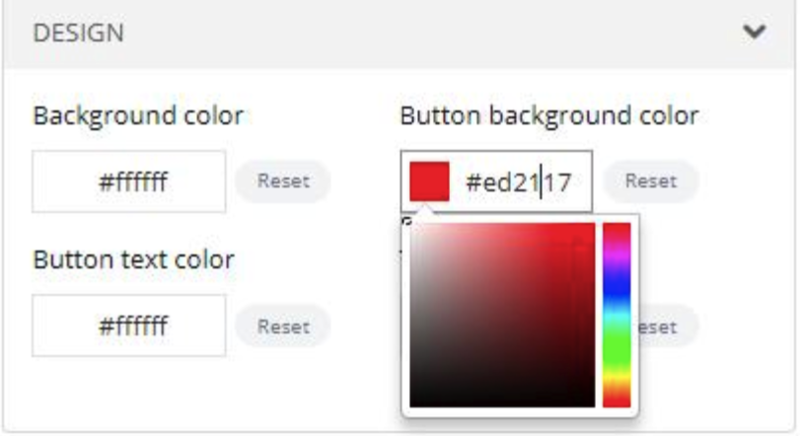 Select colors from a color palette. TIP: enter your customer’s hex color codes for a perfect match to make the ad experience a seamless extension of their website. Add and position a logo, and customize the wording for each field and button. TIP: the preview will automatically update as you type so you know how much space you have for wording. Keep your message succinct and easy to read; visitors should be able to clearly recognize the call to action and decide in just a couple seconds whether or not the offer is valuable to them. 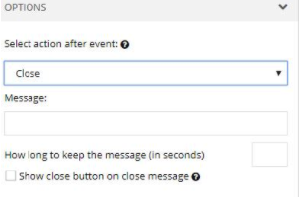 Decide what happens after a visitor enters their information and clicks the submit button: display a message for a set amount of time, or redirect the visitor to a new page. TIP: include a simple message that lets visitors know what to expect, such as “Thank you! Check your email for your free ebook.” Or, if they clicked to redeem an offer for a recommended product, you can redirect them to the product page so it can be added to their cart. The animation drop-down menu gives you several options for how the overlay enters the page. Clicking on each one will show you a preview. TIP: while animation may help attract visitors’ attention, it may also make the offer more disruptive. Consider A/B testing a campaign to see whether animation helps or hinders. Below the animation menu you’ll have the option to choose how visitors are able to close the offer. TIP: in general, it’s a good idea to make it easy. There will always be people that immediately close an overlay (regardless of the offer) because they’re annoyed and want to get back to what they were reading. Making them struggle to close the offer could turn them off from the site altogether. 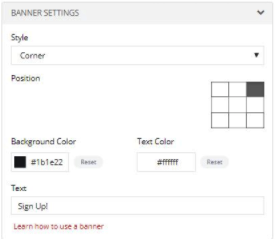 The Banner settings allow you to create a discreet, constant reminder of your customer’s offer even after the overlay is closed. TIP: you can choose a tab, like the example from Picreel’s website above, or choose an “image” and upload anything you’d like (i.e. bell, clock, ebook cover art, dollar sign, etc.) that supports the offer. Picreel allows you to upload a custom font or specify a font family to use on your offers to reinforce your customer’s brand and complement their website. TIP: for some brands, fonts are just as defining as their logo (think Disney or Google). 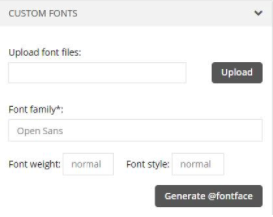 Along with logos and colors, a custom font is a great way to brand your customers’ offers to give them the same look and feel of their website. You can choose to personalize your customer’s offers with existing data from their CRM, email system, or marketing automation platform. Check this box now, then you will have the opportunity in the Targeting section to specify the data source. TIP: as part of your Picreel Agency Plan, you receive advanced ad personalization services that your CRO specialist will help you set up. The Targeting section is where you’ll decide what visitors will see the offers, when, where, and how often. Picreel provides very specific targeting options so that you can show the right offers, to the right people, at the right time. First, you will specify which page(s) the campaign should appear on. TIP: your Picreel CRO specialist can help you with this, as there are ways to capture many related pages without entering each individual page URL. The next section in Targeting is “When Overlay Appears,” which has multiple options that we’ll cover below. If applicable, set a schedule for your customer’s offer campaign. TIP: this is useful for limited time offers and promotions; having the campaign automatically go live and shut off is one less thing for you to worry about doing. The next 5 options below control the triggering of your offer – what has to occur while a visitor is on your customer’s site before the overlay will appear. For each of the trigger options below, you will need to select “active” or “inactive” from the dropdown menu. Once a trigger is active, it will have a green check mark; a gray check mark indicates inactive. TIP: you can also activate multiple trigger options, such as “On Exit” and “After Scrolling X Percent.” In this case, the offer will appear when the first condition is met, but not when both are met. The “On Exit” trigger option uses advanced mouse-tracking technology to identify when a visitor moves their cursor to exit a site. TIP: you can set the sensitivity to “high” to trigger the offer as soon as the cursor crosses the toolbar, or “low” sensitivity, which waits until the cursor is closer to the title bar. “Medium” sensitivity is in between. The “After X Seconds” trigger option displays an offer after a visitor has been on your customer’s site a set amount of time. TIP: this is a good option on product, service, and blog pages where you want to give visitors a bit of time to familiarize themselves with the content before showing them an offer. As with the timing trigger, the “After Scrolling Down X Percent” option lets you to wait a bit before serving a pop, allowing visitors to read (or at least scroll) through a certain percentage of the page before seeing an overlay. The “On Click” option is where you apply the ReelLinks overlay, which allows you to display an offer when a visitor clicks on a link or any other CSS selector on the page. TIP: use this trigger option wisely, as too many overlays as a visitor clicks through a site could be seen as intrusive and disruptive. Next, under “Other Options” you’ll have additional targeting options that allow you to specify which visitors see your customer’s pops. Choose whether all, new, or returning visitors see your customer’s offers. TIP: choosing “new visitors” only allows you to respect frequent visitors by not showing them the same offer every time they’re on the site. Likewise, if you’re personalizing an offer with information from your customer’s CRM, you would display that personalized overlay to “returning visitors” only. This option allows you to show offers to visitors based on where they came from on the web. TIP: you could potentially set up 4 separate campaigns based on how people landed on your customer’s site, which allows you to fully-customize the offer. For example, if your customer’s product was featured on a predominant industry blog, you can enter the blog’s URL as the referring domain and create an offer exclusive for the blog’s readers. Location targeting allows you to show visitors an offer based on where they are located. TIP: use this option when you have a country-specific offer (i.e. free shipping to Mexico and Canada), or when you want to create separate campaigns in other languages to be inclusive of international visitors. Show a visitor an offer only after they have visited a set number of pages. 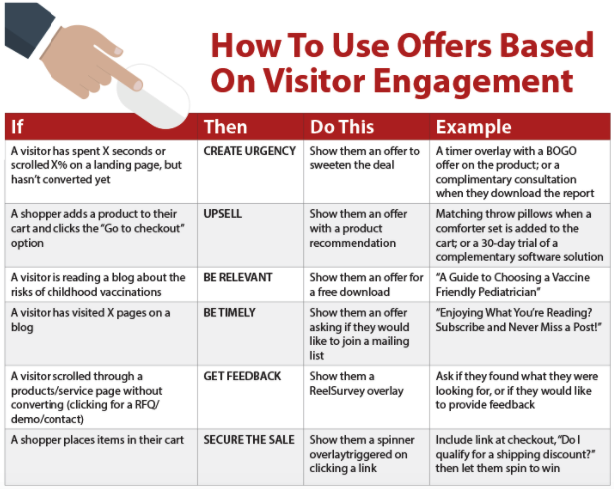 TIP: this minimizes the chances of being disruptive and increases the likelihood that the visitor will be receptive to the offer since they’ve already invested time on the site. Picreel offers work on any device; this option allows you to select which device a particular campaign should display on. TIP: Picreel features mobile-optimized templates that are compliant with Google’s interstitials guidelines. If you want your campaign to display on multiple devices, you will need to create a separate campaign for mobile and desktop/tablet. Prioritize multiple campaigns with this targeting option where “1” is the top priority. TIP: if you have an offer for newsletter signups after scrolling 50% and a separate offer for free shipping on exit, you can prioritize the campaigns to decide which is more important for visitors to see first. This is where you will specify the data source and fields to personalize the campaign. Remember, your Picreel CRO specialist will help you connect to your customer’s database and set up this unique targeting feature. TIP: this is where you can add a name (i.e. “Welcome back, Marie!”), or customize the offer based on data your customer has previously collected (i.e. displaying a VIP offer to past customers that have spent more than $500). Use cookie targeting to display an offer when a specific cookie is available on your customer’s website. TIP: this Knowledge Base article provides specific examples of using cookie targeting, such as showing different offers to visitors based on whether they are logged in, registered with an order, returning, or new. Your Picreel CRO specialist can help you get the most out of using cookie targeting for your customers’ campaigns. available, even after the visitor has closed the initial offer. 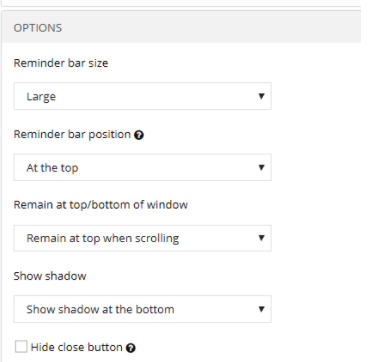 You will be redirected to a new page to set the parameters for the reminder bar if you choose to use one. TIP: experiment with the size and position of the reminder bar, and whether it remains anchored to the page or scrolls with the visitor. This is a great feature to do an A/B test on to determine if visitors simply need more time on the site before making a decision. Remember, “banner blindness” is a very real phenomenon that causes many people to instinctually close an ad before even reading it. A reminder bar makes the offer accessible even after it’s closed, so that it’s still there when the visitor is ready to be receptive. Picreel’s built-in A/B split testing allows you to test two variations of an offer to see which performs better. 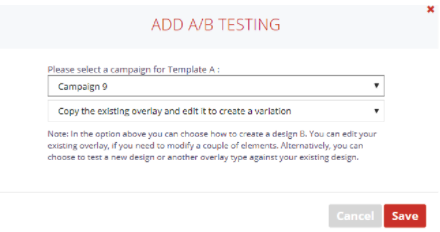 Start by selecting the campaign you want to test, then decide if you want to copy the campaign and make small changes to the design, wording, or targeting; or if you want to create a totally new campaign to test the original against. TIP: try not to make the changes too drastic as it can be difficult to discern what differences, or combination of changes, contributed to the performance. For example, copying the campaign and offering 10% off in A and 15% off in B would give you a clear picture of whether that extra 5% made a difference in conversions or not. Making changes to the design, wording, and targeting would make it difficult to tell which factor improved performance. Once the A/B test campaigns are activated, you will be able to see side-by-side results by clicking the “Statistics” button from the A/B test page. In the example above, campaign A resulted in a 19.36% conversion rate, versus 4.86% on campaign B, making A the clear winner. Whether you manage 5 customers or 50, your agency dashboard allows you to see real-time results for every customer and every offer campaign simply by toggling between accounts from a drop-down menu. No logging in and out, and no managing multiple accounts for your customers. When you’re in one of your customer’s accounts, you can click Statistics on the left menu for an overall snapshot of visitors, impressions, conversion rate and conversions. This is a combination of all of that customer’s campaigns. To view individual campaign statistics, click Campaigns on the left menu and then click Statistics next to a campaign. 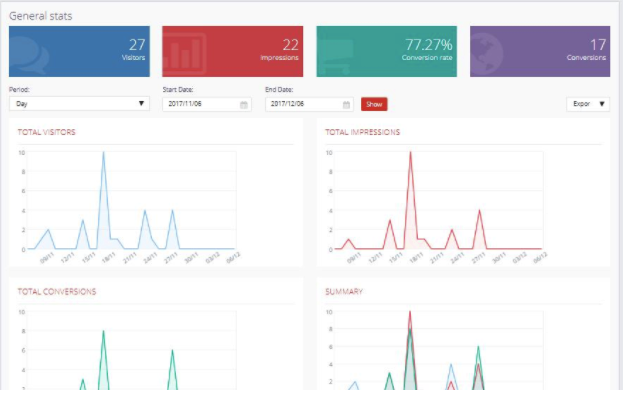 The agency dashboard gives you clean, clear, and easy-to-use statistics, making it a snap to grab screenshots and add CRO results to the reporting you provide to your customers. Picreel is a true turnkey CRO solution. Setup takes minutes, and the cloud-based software easily connects with all major website and ecommerce platforms in just a few simple steps. For example, check out how easy it is to add Picreel to a WordPress website using a plugin. Once you’ve installed Picreel and created a campaign, you’ll be able to export new leads directly to your customer’s email marketing platform. For example, here are the instructions for integrating with the popular email service, MailChimp. For each campaign, you will have the option to automatically send the leads collected to a designated list in your customer’s email marketing system. This instant segmentation eliminates data entry and, when sent to a list with a workflow already set up, ensures all new leads automatically receive the proper follow-up email. For automation-savvy agencies that prefer to spend a little extra time on setup in order to automate even more downstream processes, Picreel boasts 300+ integrations with third-party apps. For example, with the Picreel-Apiant integration, you can bypass the configuration of your customer’s email marketing, CRM, and marketing automation platforms, and send data to Apiant first. In Apiant, you specify what happens to the incoming data from Picreel, what system it should flow to, and what action each system should take with the data (i.e. automatically send a welcome message from the email system, add the lead to the CRM and notify the lead owner, schedule follow-up tasks for sales representatives, etc.). While you could sell Picreel’s CRO service to each of your customers, install it for them, and create and manage their campaigns, you’ll have to deal with the hassle of multiple logins and limited features based on what pricing plans they select. With Picreel’s Agency Plans, you get all the features of our lower priced plans plus a dedicated CRO specialist that performs website audits, advanced ad personalization services, unlimited websites and subaccounts (meaning the more customers you offer Picreel to, the higher your ROI! ), a master agency account with one login to manage all your accounts from a convenient dashboard, priority phone, chat and email support, and a guaranteed 25% boost in conversions. Conversion rate optimization is serious business, and you’re responsible for delivering results to customers. While you could spend months overhauling your customers’ websites for improved performance, Picreel offer campaigns are something you can implement and start seeing results from right now. Ready to learn more? Schedule a free consultation to discuss your customers’ conversion goals and see how Picreel is the solution your agency has been looking for.